Hello! Today I have Enchanted Polish August 2014, September 2014, and October 2014 to share with you! As you probably know, these polishes are special in that they are mysteries - you don't know what they look like until you get them! So if you haven't gotten yours yet and don't want to ruin it for yourself, I suggest you leave now (but come back later!). And now for the pretties! First up is August 2014, a magical green-y teal multichrome that shifts blue and purple. It is totally mesmerizing! Two coats here. blue than the other (teal) fingers? outdoors, sun - see how at an angle it is more blue than teal? 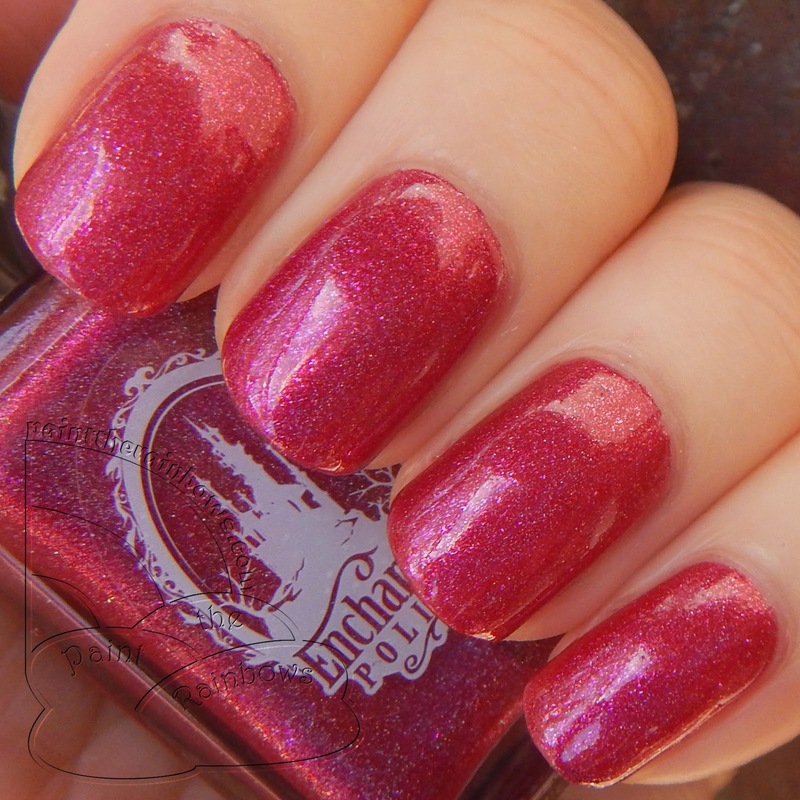 Next up is September 2014, a bright pink-ish red holo with pink shimmer. This is soooooo beautiful, I am in love! It also happens to be quite similar to Cranberry Cosmo, which is quite difficult to find these days - so if you've dreamed of CC, this would be a much easier to obtain, just as beautiful alternative! Two coats here. Lastly is October 2014, a super dark blackened olive green holo with green-y gold shimmer. Very fall, very holo! Two coats here. All such beauties! I love them all :) These polishes were a one-time preorder, but if you love them and want them, you should definitely be able to find them in the Facebook polish sale groups or Storenvy pretty easily (and for not too much either)!